New technology with more power! All new technology for a tuning favourite. We have continued development for the ST225 despite a never model taking its place, we have improved what we have made peviously. 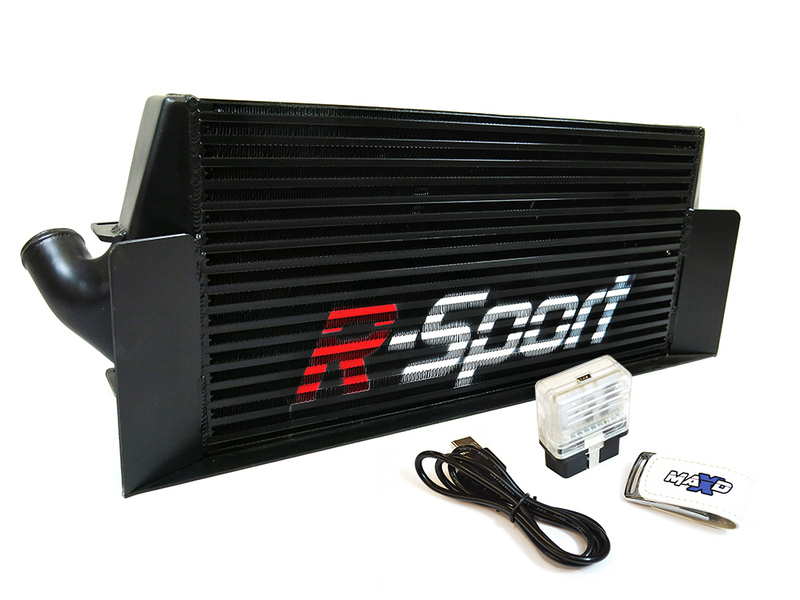 An all new "Stage 2" R-Sport intercooler has been created with a larger core and air directing fins ensure better cooling ability, and still retains its standard replacement appeal. Secondly our tried and tested maps have been rewritten, torn apart and enhanced making more power and torque than ever before. Many rolling road days have gone into developing the all new MAXD Focus ST225 Software. MAXD can now give you the total control and custom tuning files you desire and email them worldwide. MAXD can even supply a custom tune whilst your car is sat on the dyno. The very Popular Pumspeed Ultimate tune set has been totally rewritten with new VCT, new ignition maps and injector scaling to add power and torque for the same and often lower boost levels. The Pumaspeed U412 has now been MAXD-OUT totally transforming and maximizing the stock turbo into the MAXD M440 which has been written to included Focus RS Mk2 440cc injector scaling and RS Style ignition mappings to bring the best out of the Focus ST225. What maps are included ? You get the custom tune box + the USB stick with all the software and all 5 tunes listed below. MAXD M315 - Smooth progressive road remap specifically for the medium modified cars. MAXD M325 - Aggressive remap specifically for cars with the full Bolt ons and Stock Turbos. For all 2005-2007 vehicles with AE and AF type ECU, MAXD have written a conversion file that allows the car to have the updated 2008-2011 version 7BUG firmware. Once this free upgrade is performed the car will have genuine Ford OE 6M5Y-12A650-AG software. After this update any of the new files can be uploaded to the early car without a trip to the Ford agent. The Pumaspeed Workshop team are ready to fit the ST225 R-Sport Stage 2 Intercooler and Ultimate MAXD Box Package in our Head Office located here. Therefore making parts and labour a total cost £777.00 (inc. VAT). Pumaspeed have a specialist distribution team that can dispatch the ST225 R-Sport Stage 2 Intercooler and Ultimate MAXD Box Package to any destination worldwide.